Want a new career in event planning? Get out there and volunteer! When people ask me about my career path they are always surprised to find out I went from producing a political television show to producing special events. They ask how I made the jump and I enthusiastically say – volunteer work! Since my first year of high school I’ve been volunteering to plan special events. As a student at Wooster High School I was in leadership classes where we planned events, and I volunteered at the Italian Festival each year as part of the Partner in Education program with Eldorado Hotel Casino. I enjoyed volunteering at special events because it was fun, I learned new skills, met interesting people, and became knowledgeable about basic event logistics. I volunteered every time an opportunity was presented. After college I became a Wrangler volunteer for Reno Rodeo Association and two years later a member. The more I volunteered to work on special events the more I realized it was a great creative outlet for me. After eight years producing Nevada NewsMakers television show, I decided it was time to make a change. I wanted to get out of politics and media to try something new. I started applying for marketing and community relations jobs. One day I realized I should also look at event planning. “Choose a job you love, and you will never have to work a day in your life.” the famous Confucius quote became my motto. Every job listing I saw for event planning required several years of experience. Since I spent most of my free time since being a teenager volunteering I had an incredible list of experience. I had a wide variety of volunteer references from my experiences volunteering with Reno Rodeo, Reno Santa Crawl, Rotary Club of Reno, and several other non-profits. All my experience came from volunteering and it made me the best candidate. If you want a career in event planning one of the best ways to develop experience is through volunteer work. My suggestion for anyone that wants to start a new career in event planning is to get out there and volunteer. Use the volunteer opportunities to learn new skills and build a network. I’ve met some of the most amazing people in my life while doing volunteer work and they have made a big difference as I went from one career to the next. I was one of the lucky ones that turned my hobby and passion for special event planning into a paying gig, and you can too, if you get out there and start building a great resume through volunteer work. Know any other great special events looking for volunteers? Please post in the comments. Ever wonder what event attendees are thinking? Wish you could get instant feedback? Want to start a real time conversation with attendees during your event? Well you can if you master the hashtag, aka # (formerly known as the pound sign to anyone born before the 90s). Don’t know what a hashtag is? Click here. For many years large events have used hashtags (#) for their events and now smaller event producers are also using this technology for event marketing. Some of the larger events using hashtags well are the Oscars, Super Bowl, and Olympics. Hashtags can now be found on almost every type of social media. They don’t work on LinkedIn (yet) but I’ve seen people try to use them there as well. Odds are your event attendees are using hashtags so it is time to jump on the bandwagon and add this tool to your event marketing arsenal. It is best to include your hashtag in all your promotions, press releases, website, and advertising. 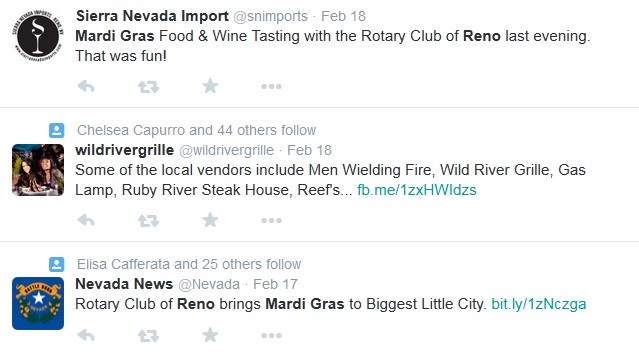 Your goal is to make it easy for your event attendees to find your hashtag and interact. A good hashtag will be short, unique, easy to remember, and of course connect people to your event. You need to promote your hashtag well before your event so everyone knows it exists. You also need to promote the hashtag at your event. A tattoo on your forehead will work, but maybe you could try something a little more subtle like plastering it everywhere you can at your venue and on your marketing materials. I must confess I had a hashtag failure last week. I’m a volunteer on a marketing committee for my Rotary Club’s annual Mardi Gras fundraiser. About a week before the event we started using the hashtag. I added it to the press release and labeled it on the back of the press passes. If anyone gets a hashtag it is going to be the savvy media folks that received our press packets…wrong! It didn’t work at all! Rotary Club members failed to catch the concept. Our vendors and the press that showed up also didn’t realize there was an official event hashtag. We blew it by getting in the game too late and not playing through. The good news is we will do better next time. We learned that it is important to use the hashtag well before the event and it needs to build engagement. Next year we will also be proactive and thank people for using the hashtag. We will invite them to join and continue the conversation about the event. During the event we will join in and create conversations using the hashtag. This should be a lot of fun because it is a wine and food tasting event. Down the road I’ll post about how to manage your hashtag during the event and what to do once the event is over. In the meantime please comment on event hashtags you’ve seen used and if they were successful. I want to explore this concept more so I’d appreciate any feedback from #EventProfs #DoingItRight out there. 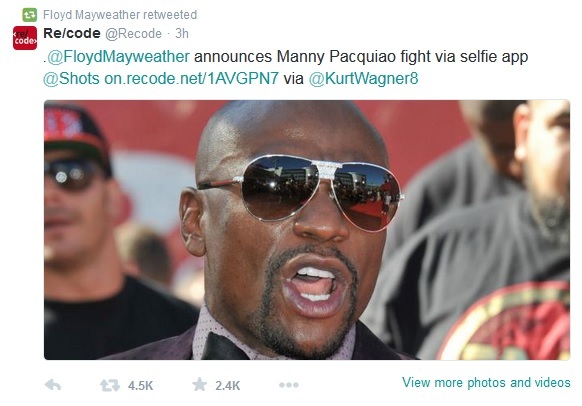 Mayweather negotiated the terms and conditions to announce the fight first. Just saw the Tweet! Mayweather and Pacquiao confirmed their fight today for May 2 in Las Vegas. Like all good Casino event planners, I was thrilled! I’m not necessarily a fan of fighting, but I am a fan of giving our customers what they want, and they love fight night! This fight is being billed as the richest fight ever because of the amount of money involved. According to The Associated Press, Mayweather could earn $120 million (or more) and Pacquiao will most likely earn $80 million. Add in the profits from tickets, sports betting, and pay-per-view revenue and this event is going to break financial records. I guarantee most Casinos in Reno will have fight night parties or show the fight on the casino floor screens. Oddsmakers are already picking favorites and expect tens of millions to be waged on the fight in Nevada alone. These two boxers are incredibly popular for various reasons so there is going to be a lot of interest for fight night parties and casino events. We usually show the fights in the Celebrity Showroom at the Nugget Casino Resort and they do quite well. Fans like to watch the fight in the glamorous showroom, it is a fun and unique place to watch fights. Since this is going to be the biggest fight we’ve seen in a long time we might need to move the party to the Ballroom. Before I start planning this fight night party I’d love some words of wisdom from fight fans. Have you ever gone to a fight night party? Please comment below on what was the best and worst part of the event. Is there anything that would have made it a better experience? I’d bet this fight won’t end in a knock out – but my fight night party will! Sometimes you get lucky and your brand gets a spotlight opportunity because of being in the right place, at the right time. That is exactly what happened to brewers Two Bald Guys this week when I appeared on Channel 8’s morning show and was able to promote their beer being launched at Brew HaHa. We promoted Brew HaHa on the radio and local television news stations last week and focused on new local products being launched at the event. It is always a good idea to highlight local businesses. Two Bald Guys are new local brewers that we wanted to promote as part of the event. We took Two Bald Guys and Sierra Arts Foundation Executive Director, Stacey Spain, to Wilks Broadcasting stations 100.1 KTHX, 92.1 The Wolf, and 100.9 The Bandit to announce the launch of their new craft beer and promote Brew HaHa. 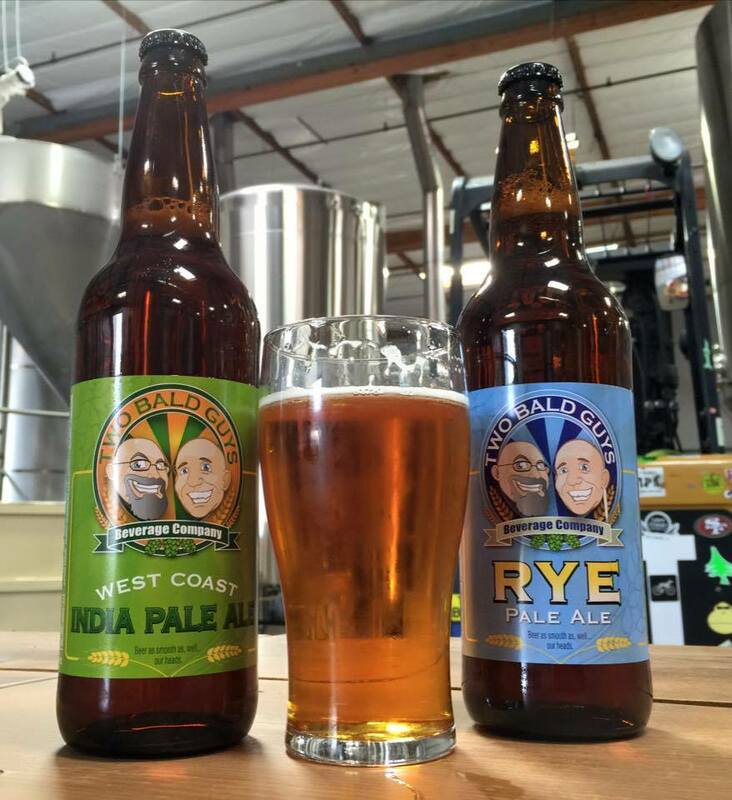 After the interviews were over they gave me a case of their India Pale Ale and a case of Rye Pale Ale so I could take pictures for social media. Giving me two cases of their brand new product was extremely generous. I had a last minute interview scheduled for the next morning at 5:30am with KOLO 8 Good Morning Reno. I was a little scared to say yes to the interview because that meant I might have a 21 hour work day since it was the same day as the event. I never want to waste an opportunity though, so I jumped at the chance. I wanted to bring beer with me to the interview as a visual aid. I was in luck! The two cases of Two Bald Guys brew was still in my car. I took the brew with me to the interview and gave them a nice shout out on air for launching their product at Brew HaHa. I found out later that day that their investors were watching and they were thrilled to see the interview. Marketing Score! This all happened because they gave me the cases. 1. Make it easy for others to promote your product. They taught me about their beer and then were generous enough to give me two cases, which put their product in the right place, at the right time. 2. Think about what the viewers and listeners want when you are trying to promote your event. Knowing your audience is incredibly important! 3. Always say yes to the 5:30am interview. After the interview my cell phone started ringing off the hook. It is amazing how many people saw the interview. The investors saw the interview, and so did my coworkers, business associates, and friends. It was totally worth the early wake up call, and all the makeup to cover the bags under my eyes. Brew HaHa – The best beer event in Reno! Looking for something fun to do Friday night? The 20th Annual Brew HaHa is the place to be on Friday, February 13th. As the Director of Special Events at Nugget Casino Resort, I am lucky enough to be on the planning committee for Brew HaHa. My main responsibilities for this event are inviting brewers and distributors to participate, set-up / logistics, and public relations. I will share some behind the scenes stories and photos after the event, so stay tuned to Mad About Events Blog! Proceeds from Brew HaHa benefit one of my favorite charities, Sierra Arts Foundation. The funds raised benefit the foundation and help them provide support for area artists and community programs. Last year the event raised approximately $44,000 to support local art programs such as the Elder Care Concert Series and Arts in Education. So what is Brew HaHa? It is an all-you-can-responsibly-enjoy beer tasting event. For the price of admission you can try beers from all over the country and enjoy a great concert. This year the event will feature roughly 120 different types of beer. The bands Jelly Bread and Mojo Green will be providing live music to keep the party going through the evening. We are excited to feature these bands because of their local roots, and because they know how to bring the funk. Good luck staying off the dance floor when these bands play! Brew HaHa is an opportunity to try a wide variety of beers , including the newest microbrews and ciders. This event is well-known on the west coast, and often taken for granted by locals in the Reno-Sparks area because they don’t realize the significance of the event to the brewers and distributors. As Renoites, we are lucky to have this event in our town. Many brewers use Brew HaHa as an opportunity to test out new products and launch new brands. They donate all the brew for the event – 100%. At the event brewers build relationships and interact directly with their customers. The event is great for brand recognition and marketing. It is also a bit of an industry networking event for the brewers and distributors. This year New Moon will be launching a new brew. Long time brewers from Two Bald Guys Brewing will also be launching their brew at the event, as well as a few others. You can try it before you can buy it! VIP ticket holders get in an hour early to talk to the brewers and see a special brewer presentation. This is a must-attend event if you’re a home brewer looking to take the next step, or a consumer looking to try new brews. If you are a beer lover or aspiring beer lover, don’t miss Brew HaHa Friday night at Nugget Casino Resort! • Ticket prices go up $10 at the door the day of the event. • There will be a raffle featuring beer swag including a poker table, beer branded hoodies, and backyard fire pit to name a few prizes. • Proceeds benefit charity – so come have a beer for a good cause! Welcome! I’m Lisa Jansen and I’m Mad About Events and Marketing! I’ m a Nevada girl at heart. I’ve got passion, a sense of humor, and enough grit to make the most challenging situations enjoyable and rewarding. Some have even dared to call me “disarmingly charming”, and I’m pretty sure they meant it as a compliment. I drove my parents crazy when I was growing up because I was obsessed with events and party planning. They even bought me a shirt that said “Social Director” because the title fit. Let’s face it: I’ve always been mad about events and marketing. In college I started taking marketing and business classes. I found the perfect combination to go with my obsession for event planning. There is something so special about marketing. It isn’t just sales, it is helping people meet their needs. I’m one of the fortunate ones that have been able to turn my passion for a hobby into a career. It took a lot of hard work and volunteering, but I was able to turn my hobby into a paying gig. I plan on using this blog as a tool to share my expertise and to help other event planners on their path. During my career so far, I have produced events varying from small non-profit silent auctions to world class food oriented events that approximately 500,000 people attend over a six day period. My goal is to add more value to your life by helping you improve your business and quality of life through event planning, marketing, customer service, networking, sponsorship relations, and exploring what makes event producers and marketers tick. I will share things I’ve learned through trial and error along the way. I hope reading about both my successes and my mistakes will help others succeed and also avoid some of the landmines in this industry. I will also share my thoughts on the industry, new trends, and some other event producers’ stories as well. These stories will hopefully inspire and amuse you at the same time. In a way, event planning is an addiction. It is a practice that is both psychologically and physically habit forming and to stop may cause severe trauma. Everyone has a story and most event producers I’ve met share this addiction and are mad about events. Every event is like a roller coaster: you get butterflies, experience big ups and downs, and in the end you are happy with how you lived through it to tell the story and you can’t wait to go on the wild ride again. Welcome to Mad About Events! Please become an active participant because the more views shared here the more it will help other event planners and newbies to the fascinating field of marketing and producing events. My email address is LisaJansenNV@gmail.com if you’d like to email me. Please leave comments on the blog, tell me what keeps you up at night as an event producer, share other blogs that are of interest, recommend other posts, and share your own story. What is more compelling and inspiring than reading about someone else’s path to success? I encourage and appreciate your feedback.